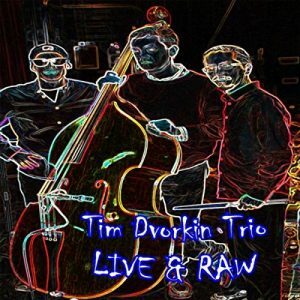 The Tim Dvorkin Trio, led by keyboardist Dvorkin with Bradley Mellen on bass and Rick Soriano on drums, has released a new live album this summer entitled Live & Raw. Recorded live by Tony Rice at a Jazz Wednesday appearance at Brothers Drake this past December, the 7 song collection highlights Dvorkin’s original fusion compositions and the well-honed interplay between the skilled instrumentalists. While four songs are brand new, three are revamped carryovers from 2015’s Live at Brothers Drake, shedding new light on the material via new arrangements and fresh performances by the group. The album is available for purchase and sampling from CD Baby here, and is also available from other digital retailers. The trio, with Terry Douds on bass, will perform at the Westerville Amphitheater on Saturday, August 19th at 1:15pm as part of the 2017 Jazz At The Amp Finale which includes a variety of Columbus and international talent all day. Details for a release party are still to be determined – Stay tuned here and to Dvorkin’s website for news. Keep reading for my thoughts on the Tim Dvorkin Trio’s excellent new album. The album gets off to a soaring start on “Bedtime Blues,” with the rhythm section carving out a buoyant groove and Dvorkin out front with a charging melody and a wide-ranging solo. “Thelonious” follows, with Mellen laying down a thick, sultry bassline, Soriano adding a steadfast rhythm and Dvorkin putting a slinky melody on top before later accelerating across the keys. Mellen opens “Grooveland” with an extended, unaccompanied solo that twists and turns before settling into another big groove that his bandmates attack with fervor and finesse before all three unleash heartfelt passages, including some fiery breaks from Soriano. “Where Is All Your Love” slows down the proceedings for a moment and is rendered with yearning feeling, led by Dvorkin’s graceful work on the keys. “Without You” has a heavy, pensive feel before hitting a more uplifting section, all powered by Soriano’s crackling rhythms and colored by Dvorkin’s darting work on the keys. “G.B.” starts with beautifully somber piano, then Mellen jumps in with a passionate solo that leads to more sparkling work by Dvorkin that takes the song’s drama to thrilling heights. Closer “Some Like It Hot” indeed finds the group going out hot, with Dvorkin cranking out a piercing melody that gives Mellen and Soriano plenty of room to add spice, and all three make their presence felt loud and clear before they wrap up.